PORT-AU-PRINCE, Haiti – Using an improvised pulley system, two members of the St. Martial Minor Seminary Alumni Association carefully lowered a box of books 40 feet to the ground, salvaging yet another couple dozen resources from the seminary’s battered library. Four staff members were working inside, stepping gingerly around the debris on the top floor of the seriously damaged building that houses classrooms, offices and the library. Their job was to pull books from what shelves remained upright and package them for the short trip to the courtyard below, where alumni were checking the contents, marking the boxes and taping them shut before carting them off to storage. “We have a safe place for the books,” Holy Spirit Father Renold Arisme, seminary headmaster, told Catholic News Service Feb. 6. In the shade afforded by several trees, volunteers and staff had been working for more than three weeks to salvage the books and documents, most of which did not sustain serious damage despite the partial collapse of the building’s roof over the library. Once sealed, the boxes were stacked under a tarp in the adjacent St. Martial Church. Eventually, they will be taken off-site for storage until the seminary can rebuild the library. 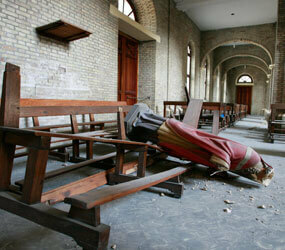 Most of the seminary’s buildings sustained damage, some more serious than others. Classes have been suspended. Dominique Franck Simon, alumni association president, said several of the organization’s lay members stepped forward when they heard about the damage at the seminary. The books, a priceless resource for the seminary’s 1,300 students, would be difficult to replace had they remained exposed to the elements on the fourth floor of the building, he explained. Jeremy Lachal, director of the Paris-based Libraries Without Borders, advised the work crew. He told Catholic News Service the organization often assists schools, universities and public libraries that sustain heavy damage in natural disasters or wars. The group focuses its work especially on poor and developing countries where resources to replace documents and books are limited. The organization also worked with the State University of Haiti in its efforts to recover books, multimedia resources and documents, he said. St. Martial Church sustained major damage when part of its western wall tumbled into the street during the earthquake. French architect Auclair Frederick said after an inspection that he believed the church could undergo repairs without being torn down. A few blocks away, a team of volunteers from the Louverture Cleary School in nearby Santo, Haiti, had worked since Feb. 1 to recover sacred artifacts, vestments and artwork from the Cathedral of Our Lady of the Assumption. Little remains of the cathedral. A look inside the shell that remains revealed the devastation. Although supported by metal trusses, the roof of the cathedral collapsed, littering the interior with concrete stones and steal beams. Deacon Patrick Moynihan, an American who runs the school as president of The Haitian Project, said the volunteers also cleared debris from one of the cathedral’s side altars. He said that as long as the site was deemed safe he hoped Mass could be celebrated to lift the spirits of Haitian Catholics. Volunteers said they recovered four Stations of the Cross and several paintings that were buried in the rubble. The artwork and artifacts were taken to a nearby chapel on the grounds of the Archdiocese of Port-au-Prince headquarters. One important document, the 1997 papal bull signed by Pope John Paul II appointing Archbishop Joseph Serge Miot to lead the Archdiocese of Port-au-Prince, was recovered as well. Archbishop Miot was killed at his residence near the cathedral during the earthquake.